4The excerpts used are from Constantinos Th. Dimaras, Ελληνικός Ρωµαντισµός (Athens: Ερµής, 1985), pp. 405–406. 5Ioannis Kolettis [1773, Sirako (Epirus) – 1847, Athens]: medical doctor, politician and writer. He was educated in his hometown of Sirako and in nearby Kalarites, both prosperous towns in eastern Epirus. He then moved to Jannina, the commercial and educational center of the region, where he became involved in trade. From there, in 1800, he traveled to Pisa, where he studied medicine and came into contact with Bonapartist circles. In 1807 he returned to Jannina, where he was appointed as doctor in the service of Muhtar Pasha, the son of Ali Pasha of Tepelen. After Ali Pasha’s defeat by the Ottoman forces and his execution in 1822, Kolettis found refuge in his hometown. During the Greek War of Independence he tried, unsuccessfully, to instigate an uprising there. He then escaped to the Morea (Peloponnese). There, thanks to his education and his political abilities he was soon appointed to the administration, and he served in it throughout the war and then under the first governor Capodistrias and the Regency. As soon as King Otto took over in 1835, Kolettis was sent to Paris, where he served as ambassador, a post he was assigned to in order to keep him away from Athens. During these years, Kolettis came into contact with the political elite of the French capital, for whom he symbolized the warrior-hero of the Revolution, a profile he systematically cultivated. However, with the constitutional movement in 1843 he returned to Greece, where he was appointed prime minister, a position he retained until his death in 1847. During this turbulent period, he managed to monopolize power. Notoriously crafty, he convinced different groups that he was promoting their interests. Above all, he enjoyed the devotion of the Rumeliote παληκάρια (brave young men), whom he used in campaigns of political terrorism. Kolettis is considered the first important politician of the Hellenic state, who skillfully managed to survive in the harsh conditions of the aftermath of the War of Independence by using violence and personal coalitions regardless of ideology. Though he championed universal values, in his political activity he implemented a nationalist discourse which bore little relation to these values. 6During the Greek War of Independence, uprisings broke out in many regions of the Balkans. However, most of them were eventually suppressed and the revolutionary movement managed to hold out only in the Peloponnese and Central Greece. Therefore, after the foundation of the Hellenic state in 1830, only these regions were included within its boundaries. From the Greek point of view, despite the miserable conditions in the newly born state, its boundaries were considered temporary. From the enthronement of the first king of Greece, the Bavarian Prince Otto (r. 1832–1862), until the defeat in the Greek-Turkish War of 1919–1922 and the compulsory exchange of populations, under different circumstances and in several forms the redemption of their ‘enslaved’ brothers had been the predominant ideology of Greek politics. 7However, in 1843 the king had to deal with a domestic crisis. On 3 September, the veterans of the War of Independence, who had been completely marginalized by the new regime, together with their military officers who could not bear being subject to Bavarian commanders, handed an ultimatum to the king. Their major claim was that Otto should not reign uncontrolled. Therefore, they demanded that a National Assembly was to be convened in order to provide the country with a constitution. The king had no alternative but to accept their demands and proclaim the opening of the Assembly. Many political and military figures now made a glorious return. Among them, Ioannis Kolettis, for years ‘exiled’ in Paris, was called back to take over as the leader of the ‘French party.’ These parties had existed as early as the revolutionary period, the French, the English and the Russian parties being connected to the corresponding Great Powers. However, during the period of Otto’s absolutist rule they had remained in the shadows. Now, under the new circumstances, they resumed their activity. 8Within this political and ideological atmosphere, on 14 January 1844, the National Assembly debated the articles of the new constitution. One of the most important issues at stake was the third article, which defined Hellenic citizenship. A few days earlier, a new element was introduced into the debate when certain deputies proposed the stipulation of a distinction between native—autochthones—and immigrant—heterochthones—Greeks. Under the nationalist rhetoric the debate had a strongly social character. When the Hellenic state was founded in 1830, most of the offices in public administration were occupied by heterochthones—mainly Phanariots, but also individuals who came from Western Europe. As early as 1844 the University of Athens, which had been founded in 1837, produced its first graduates. These young professionals strongly opposed the right of immigrants to occupy public office. 9In his speech, Kolettis, relying on historical arguments, demonstrated the duty of liberated Hellenes to fight for the liberation of all Greek lands. This constituted the ‘Great Idea’—Megali Idea—of the Hellenic race. Greece was considered to be the center of Europe. It did not belong either to the West or to the East, which allowed it to be Western and Eastern at the same time, a topos which would be the source of many ensuing cultural and political projects. In the past, Greece had enlightened the West, and now it was destined through its rebirth to offer its light to the East. In order to achieve this purpose, the Hellenes had to be united in one state, one religion, one cause and one constitution. The symbolic focus of the nation’s permanent mental mobilization should be the city that captured the imagination of all Balkan nations, the capital of two empires, Constantinople. Thus, this discourse, apart from an articulation of territorial irredentism, constituted the political equivalent of a prophecy. Interestingly, even though Constantinople occupied a central place as a political reference, Byzantium as a historical and cultural discourse had not yet aquired its dominant place in the Greek historial imaginary and the Byzantine period had not yet been efficiently integrated to the national historiographical canon. This would be the task of Kolettis’ protégé, the historian Constantinos Paparrigopoulos. Despite its obviously opportunistic character, Kolettis’ speech managed to encapsulate the concerns and the dreams of a newly established state searching for a vision. With his rhetorical ability he appealed to the patriotic feelings of his audience, reminding them of the oath taken in 1821 when all Greeks rose against Ottoman rule. 10In the event, a distinction between autochthones and heterochthones was adopted. Nevertheless, Kolettis’ speech had an enormous impact, which might be related to the fact that the term ‘Great Idea’ was already in use. The poet Alexandros Soutzos in the political drama Ό πρωθυπουργός καὶ ò ὰτίθασος ποιητής (Τhe prime minister and the defiant poet), published in 1843, used nearly the same phrasing. As a matter of fact, it was not clear what exactly Kolettis meant when coining the new term. This very fact facilitated the transformations in the content of the ‘Great Idea’ that were to follow. During the Crimean War, the ‘Great Idea’ was connected with the prospect of the creation of a Greek Empire, combining Hellenic antiquity with the Byzantine monarchy. Upon the arrival of King George I in 1864, however, official policy shifted towards domestic development and friendly relations with the Ottoman Empire. The very concept of the ‘Great Idea’ was eventually challenged by the ‘enslaved’ brothers themselves. After the reforms of 1839– 1856, known as Tanzimat, and the new opportunities opening up for the non-Muslim communities of the Ottoman Empire, the flourishing Greek-Orthodox elites of Constantinople and Smyrna (İzmir, present-day Turkey) in particular promoted the policy of Ἑλληνο-οθωµανισµός (Helleno-Ottomanism), which sought to assure friendly relations between the two states and condemned the expansionism of the Hellenic state. However, following the Berlin Congress in 1878, support for the ‘Great Idea’ was renewed and eventually led to the Greek triumph in the Balkan Wars of 1912–13 and, with the Treaty of Sèvres, the creation of a ‘Greater Greece.’ The occupation of a large district around Smyrna by the Greek army in 1919 and the launching of the Asia Minor campaign created the impression that the nation was close to achieving its dream and would proceed to liberate all unredeemed populations. The disaster of 1922 and the departure of a total of 1,200,000 Orthodox Greeks from Asia Minor and Thrace, during the period 1914–1922, marked the tragic end of this ambitious dream. 15And, of course, you have the same belief, and the same wish, because each of you has in himself the idea of his glorious Hellenic origin; every one of you feels that this Assembly was held in Athens, the glory, grandeur and inimitable monuments of which have been admired for centuries, and will continue to be admired. Athens and the whole of Greece, divided in ancient times in separate states, fell, and having fallen enlightened the world. What hope is offered today by Greece, reborn and united in one State, in one cause, and one force, in one religion, and, lastly, in one constitution, which we are now bringing about? 1 Paleon Patron Germanos, Andreas Zaimis and Theodoros Kolokotronis were heroes of the Greek War of Independence. KOLETTIS, Ioannis. 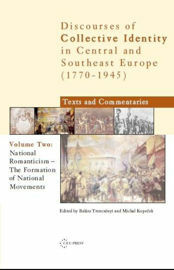 Of this great idea In : National Romanticism: The Formation of National Movements : Discourses of Collective Identity in Central and Southeast Europe 1770–1945, volume II [en ligne]. Budapest : Central European University Press, 2007 (généré le 22 avril 2019). Disponible sur Internet : <http://books.openedition.org/ceup/2323?nomobile=1>. ISBN : 9786155211249. Kolettis, Ioannis. “Of this great idea”. Trencsényi, Balázs, et Michal Kopecek. National Romanticism: The Formation of National Movements : Discourses of Collective Identity in Central and Southeast Europe 1770–1945, volume II. Budapest : Central European University Press, 2007. (pp. 244-248) Web. <http://books.openedition.org/ceup/2323?nomobile=1>.